The U.S. Citizenship and Immigration Services (USCIS) has published a revised Employee Form I-9. Therefore, effective January 22, 2017, employers must use the new form. The new Form I-9 bears a revised date of November 14, 2016, and an expiration date of August 31, 2019. 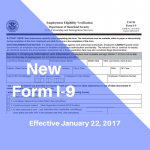 The new Form I-9 form can be downloaded here. Form I-9, Employment Eligibility Verification, is required under the Immigration Reform and Control Act of 1986 (IRCA). This requires employers to verify the employment eligibility and identity of new employees by reviewing documents provided by the employee, such as passports, visas, licenses, etc., and completing the Form I-9. This requirement applies to all new employees, including U.S. citizens. In the past, employers have had difficulty complying with all I-9 requirements. Additionally, employees frequently made errors when completing the form. Reducing errors was the intention of the new form. Section 1 now asks for “other last names used” rather than “other names used,” and streamlines certification for certain foreign nationals. Prompts were added, allowing for information to be correct. Instructions are separated from the form itself. As a result, they clearly define the information needed to complete each field in the form, making it easy to complete. Similar to other USCIS forms, the instructions are separate from the form. In addition, they also include specific instructions for completing each field. USCIS says that the new version of Form I-9 is easier to complete on a computer. Enhancements include easy access to the full instructions, on-screen instructions for each field, drop-down lists and calendars for filling in dates, and an option to clear the form and start over. When an employer prints the completed form, a quick response (QR) code is automatically generated on the form. What Happens with a Completed I-9? File all Form I-9s in a single file for all employees, rather than in each employee’s individual personnel file. The Form I-9s aren’t filed with the government. Employers retain them. If government officials show up and you can’t produce the forms, you face a hefty fine for noncompliance. Therefore, it is critical to have easy access to the documents. Federal law requires employers to have a completed I-9 on file for every employee. In addition, the employer must retain the form for the duration of employment. Upon separation, employers must retain the form for the later of either 3 years after the date of hire or 1 year from the date of separation. The payroll specialists at Bryant & Associates in Lincoln hope that these tips will help you navigate the new Form I-9. If you have questions on this form or other payroll questions, contact our team today at (402) 423-0404 or fill out our online contact form. We’d be happy to discuss your questions and put our expertise to work for your small business.